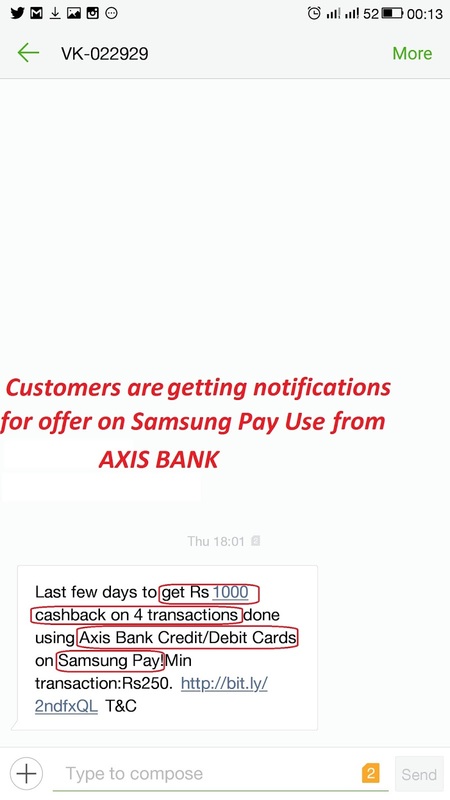 Samsung India today announced the availability of the National Payments Corporation of India’s (NPCI) Unified Payments Interface (UPI) on its flagship mobile payments service, Samsung Pay, in India. With the introduction of UPI, Samsung Pay now integrates card payments, mobile wallets and UPI in one secure app. The transactions made by users through UPI on Samsung Pay would be facilitated through Axis Bank. With the launch of UPI on Samsung Pay, users can create their unique virtual addresses @pingpay enabling them to make seamless bank to bank transfers. A unique benefit of enabling UPI on the Samsung Pay app is the integration with the users’ address book which then identifies existing @pingpay accounts on the contact list. @pingpay is the UPI handle assigned to Samsung Pay. UPI is a payment system that powers multiple bank accounts into a single mobile application (of any participating bank), merging several banking features, seamless fund routing and merchant payments under one hood. This would also cater to the ‘Peer to Peer’ collect request, where users can request for payments from their contacts, adding to the convenience of Samsung Pay consumers. “We are extremely delighted to announce the integration of Samsung Pay with UPI for our consumers. Samsung supports the Government’s vision to drive India towards a digitally empowered economy and through Samsung Pay we enable our consumers to make payments using our smartphones. Samsung Pay is simple, secure and accepted almost everywhere,” said Mr. Sanjay Razdan, Director, Samsung Pay Business, Samsung India. “We are excited to magnify UPI’s reach by going live on Samsung Pay. This initiative will surely contribute towards assisting our objective of providing convenience and safety to the customers while they make payments. 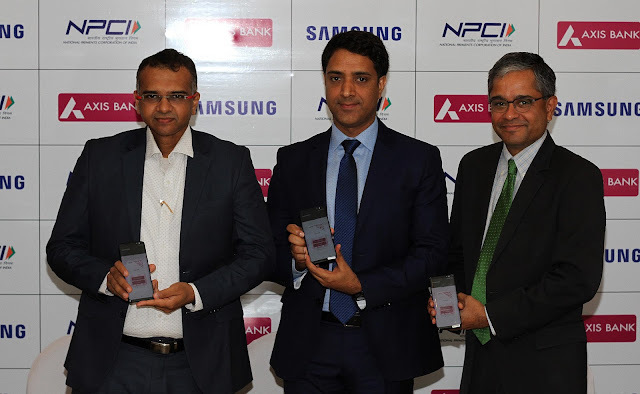 We congratulate Samsung Pay and Axis Bank for emerging as one of the first UPI adopters in this segment and for being an inspiring use case,” said Mr. Dilip Asbe, Chief Operating Officer, NPCI. “Samsung Pay is a simple and secure way to pay using the existing PoS network. The addition of UPI to Samsung Pay in association with NPCI, makes it an even more powerful proposition for customers to transfer money and make payments. We are sure Samsung Pay will play a very important role in driving adoption of digital payments,” said Mr. Rajiv Anand, Executive Director - Retail Banking, Axis Bank. Samsung Pay, which was recently launched in India, is a highly secure platform that works with three levels of security—fingerprint authentication, card tokenization and Samsung’s defense-grade mobile security platform Samsung KNOX. Simple and secure, Samsung Pay can be used to make purchases almost everywhere you can swipe or tap your debit or credit card to make payments. To launch Samsung Pay, a user needs to swipe up on an eligible Samsung Galaxy smartphone, select the card, authenticate using a fingerprint or PIN and bring the phone near the Point of Sale terminal. Samsung Pay works with Samsung’s patented Magnetic Secure Transmission (MST) technology as well as with Near Field Communication (NFC). MST replicates a card swipe by wirelessly transmitting magnetic waves from the supported Samsung device to a standard card reader. Through MST, Samsung pay will work seamlessly on a majority of PoS terminals in India. Samsung Pay is currently available on 11 eligible Samsung devices: Galaxy S8, Galaxy S8+, Galaxy S7 edge, Galaxy S7, Galaxy Note 5, Galaxy S6 edge+, Galaxy A5 (2016), Galaxy A7 (2016), Galaxy A5 (2017),Galaxy A7 (2017) and Galaxy A9 Pro. National Payments Corporation of India (NPCI) was set up in 2009 as the central infrastructure for various retail payment systems in India and was envisaged by the Reserve Bank of India (RBI) as the payment utility for all banks in the country. During the last seven years, the organization has grown multi-fold from 2 million transactions a day to over 25 million transactions now. From a single service of switching of interbank ATM transactions through National Financial Service, the range of services has grown to Cheque Truncation System, National Automated Clearing House (NACH), Aadhaar Enabled Payment System (AePS), USSD based *99#, RuPay card, Immediate Payment Service (IMPS), Unified Payments Interface (UPI) and Bharat Interface for Money (BHIM).